Ouch, that hurts. Um, yeah guilty. What is one way to combat this? Service. Go out and serve someone. Make deliberate decisions to fight against the self-absorption, against the self-centeredness, against turning yourself into a little god, which you bow to. Dang, I’m guilty of this, but I’m thankful that I’ve been set free to live a new life, a new way…. The way of Jesus… How will you serve someone other than yourself today? Join me in this fight and SERVE! That’s me. 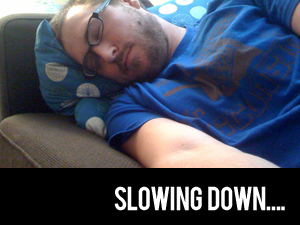 That’s me learning a bit about slowing down. See the majority of this week I was quarantined to my house, and this particular couch is my favorite. You may ask, “Whom quarantined you Zach?” Simply put, God. Yes, I said God. It wasn’t my boss, my coach, this culture or a co-worker, but God. God wanted to get my attention, he wanted me to slow down. See I’ve been going hard, like most of us, for quite some time and it would seem to have caught up with me. It was in this that God got my attention and caused me to slow down. This might make some people squirm a bit, saying that God has made me slow down, but I was reminded of it once again, as I read Psalm 23. I’ve always pondered and wondered about those verses I have in bold font. They are God acting statements, not me acting, but God acting. God makes me rest. God grabs my hands and leads me to quite places and into places of right standing before Him. God brings restoration to my soul. Why does God do all of this? For “His name’s sake.” So that He would be made much of in my life and in this particular situation, through my resting. Really? Can that be true? Can I rest in such a way that God is glorified? He can be. Recently for the Czech Project I did a ‘foundations talk’ and I included some great stuff from my friends at Soma Communities in Tacoma, WA about our Gospel Identities and Daily Rhythms. You should head over to their site and check out what they are doing! One of the Daily Rhythms is (re)creating, and as I’ve been stuck in ‘my cave’ (i.e. flat) this week I’ve been reminded of what I heard Jeff Vanderstelt, pastor at Soma, share about the Daily Rhythms at a church planting conference here in Czech last fall. I need not try to justify myself through ministry, work, maintaining an image or etc. Ultimately, if God has done the work of my justification I can rest and rest well. The question is, ‘Do I (you) rest well?’ Then by me resting well, I can demonstrate that I am not trying to save the world, that I’m not trying to work for my justification, but that I ultimately trust God. Of course, we need to be careful here and not take this to an extreme, becoming passive bystanders, that never do anything more than rest, claiming that God’s a work, therefore I need not do any more than rest. The Gospel calls us to rest and also act, but it impacts the way we rest and the way we act. Do you believe the Gospel this way? Do I believe the Gospel way? May we act with a deep love and boldness like never before believing this Gospel and may we also rest deeper knowing that God is on His thrown upholding “the universe by the word of his power” (Hebrews 1:3). Slowing down…. I love when God shows up! He surely did, while I was in Salzburg! As I headed out of Prague to Cesky Krumlov then Salzburg, on my short holiday I had a prayer that God would bring refreshment, encouragement and some peace in the midst of sight seeing, reading, train rides, caffeine, walks and life as of late. Surely, I wish I could have had some more time to work, process, pray, journal and more through the things that have taken, and that are going on right now, in life, but the moments I had were great. The Saturday I was in Salzburg, I sat at the cafe capp&ccino (which was also the only place I could find WIFI) and over a cappuccino, my moleskine, and my esv bible app on my iPhone I had a sacred moment. It was almost like I should have taken my shoes off, for the place I was sitting felt holy to me. I love that my God isn’t a distant God that is aloof, but that is present and meets me! There at Capp&ccino the God of the universe met me. I sat there, reading through Colossians and writing page after page in my moleskine, God seemingly flooded me with the encouragement I needed. The theme – love. Simply put, it was like God was whispering to my soul, “I love you. Relax. Take a deep breath. Through everything that has happened I love you. Did you hear that? I love you. I loved you, as you received criticism, as you made mistakes, as you wallowed in your pool of self-pity. In the midst of all of this – I loved you. Zach, hear this – I love you. I hung on a Roman cross for you, and punched death squarely in the jaw knocking him out, because I love you. Hear that Zach…” So, so good…. It was a couple hours of the Gospel being preached to me via the Holy Spirit, and also preaching the Gospel to myself. I once again, was reminded how badly I need the Gospel and why Paul said this to the Roman church (yes, the church, made up of believers, not simply nonbelievers), “So I am eager to preach the gospel to you also who are in Rome. (Romans 1:15)” Oh, if I was eager to constantly preach the Gospel to nonbelievers, believers and myself, what would life look like around me? I’m not sure, but I’m grateful for another wake up call to the Gospel!